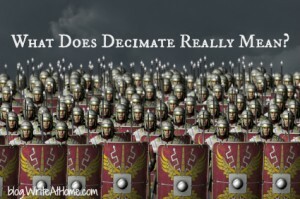 What Does “Decimate” Really Mean? Home / Blog / What Does “Decimate” Really Mean? What does the word decimate really mean? If you opened this article because you know that decimate means “to destroy one-tenth” and that the great majority of people who use this word to mean “to utterly destroy” or “to destroy large portions of” are ignoramuses in need of a good ruler-slap to the knuckles, you are going to be disappointed. If the “misuse” of the word decimate is on your list of linguistic peeves, I’m going to suggest that you open that list, highlight “misuse decimate,” and hit delete. And then take a deep breath and enjoy the fact that you have one less thing to be anxious about in life. It is true that one early meaning of decimate, according to the OED, was “to kill one-tenth.” It sprang from a harsh disciplinary practice of the Roman army called (not surprisingly) decimation. If a unit was found to be mutinous or cowardly, one-tenth of the soldiers would be executed. The earliest known use of decimate in this sense is from about 1600. The word has another early meaning as well, however. As early as 1606, decimate was used as a synonym for tithe. The OED finds those two uses so close together that they cannot confidently determine which is the original. For many years, however, decimate has been used to mean “to kill/destroy a great portion of” or “to reduce drastically.” It is often used as a synonym for annihilate. The question is, is this usage wrong? Sticklers have argued vehemently for decades that it is. They point to the origin of the word and the prefix deci-, which generally means tenth. But language changes over time. Thousands of words have come to mean something other than what they meant originally. Why is it so important that decimate retain its original meaning when so many common words no longer do? Do you only use the word incredible to mean “without credibility” or “unable to be believed”? The word nice originally meant “foolish, stupid, or senseless.” No one insists on preserving that definition. And awful, once meaning “full of or inspiring awe” now means something almost completely opposite. What I find most ridiculous about those who insist on the one-tenth meaning of decimate is how that deprives the word of virtually all usefulness. How often would anyone really need to use a word that means to destroy a tenth? I’m pretty sure the armies of the world have abandoned the original Roman practice. There are still dictionaries that list the original meaning as the primary definition, but others disagree, and I can’t help but think that the majority of English speakers, when asked to define decimate, would think of utter or near total destruction. And frankly, that’s how words are defined in English — by what users mean and by how listeners comprehend — not by etymology. Comments? Bloggers love comments. Leave yours below. Reading this awful article left me completely decimated. Seriously, all it says is that “decimate” should not necessarily mean what it originally meant and therefore should be allowed to “evolve” to mean… whatever. Heaven help us if someone tried to make the same arguments for the words “yes,” “no,” “positive,” “negative,” “emergency,” “option,” “mandatory,” “law,” “opinion,” “commitment,” etc. Does this mean I that can pay off a tenth of my bank loan and use this article to convince the bank that I “utterly” paid off my loan? Also, are Brian Wasko and Ammon Shea triplets? To prevent that ambiguity, simply reword your statement. For instance “the rabbit population was considerably reduced by myxsomatosis” = no ambiguity. I opened this article because I had just read that the words “decimate” and “destroy” are not synonymous; I wondered if “decimate” refers strictly to killing. I had no idea the word ever had anything to do with tithing. Your answer was helpful and snotty. I guess it is a little snotty. “Decimate” does not refer strictly to killing — at least not in common usage. Cities, economies, hopes, etc. can all be decimated.